Most lessons are held at White Horse Polo Ranch in Escondido, but can also be held at other locations.. With an arena, round pen and a bridal path, riders can learn the foundations of horsemanship at the ranch facility. Trail lessons can be held at a variety of locations. The Daley Ranch is beautiful at this time of year with wildflowers blooming and the fragrance of mountain sage in the air. Rancho Cuyamaca State Park, just past Julian, is an exceptionally gorgeous trail lesson setting for more advanced riders. If you have seen horses riding on a trail around the county, there is a good chance we can hold a lesson at that location. Moonlight trail lessons are growing in popularity, and are held in the beautiful San Dieguito river park on the Coast to Crest trail. 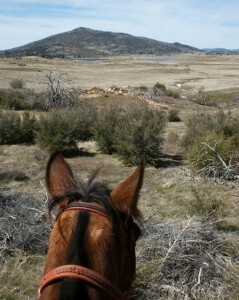 This is a scenic, but easy trail and usually the first trail lesson setting for beginners. Because White Horse Polo Ranch is a small business we can customize any of the lesson plans to fit your needs and schedule. In return please honor our time by making any cancelations at least 24 hours in advance. Call for placement and schedule. With a degree in math and experience teaching, Susan can offer a math tutoring/horseback riding lesson combo at a discounted rate. AdditionalMath tutoring is also available. Horse Camp is a once a year summer event. Abigail Purdy horse camp experience. Prices: $495/wk $105/day if not attending the full week. The Thursdays are $115 due to the horseback skills demonstration. Receive $5/ day of attendance discount if I receive a $20/day deposit to hold your spot by June 15, 2015. Please let me know your tentative plans so I can try to group students by skill levels. Spend your time riding, not shopping. When you purchase a gift certificate for someone else, I will give you $10 off your next lesson (trail, arena or polo) as a gift to you. 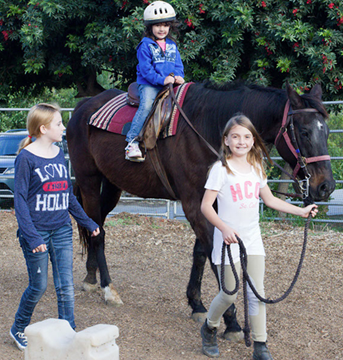 Also, you can give any dollar amount gift certificate with a minimum of $60 that can be used for a group riding lesson, or that can be applied to a private lesson or trail adventure. One popular package is a private lesson and a trail adventure. This $185 gift package insures the rider has a chance to become comfortable riding in a controlled environment before hitting the trail. A real “kid pleaser” is a package of one private lesson followed by 4 group lessons for $295. The private lesson sets the tone for safety and confidence, and the multiple rides of the group lessons carry your gift into next year. Polo is also available for gift certificates. Call to customize your Polo Package. As always, I am happy to customize any gift certificate to fit your needs, so call, email or text for more information.